My list of the Best Jewish Apps of 2010 at The Jewish Week has generated a lot of attention. The list of thirty-three apps for the iPhone, iPad and Android phones has been reposted on several blogs around the Web. With over 300,000 apps available and over 7 billion downloads to date, there are quite a few Jewish apps to choose from. I separated the utilities from the novelties, and made sure to include the Jewish apps for the Android (full disclosure: I'm a Droid user). My list includes Jewish texts and luachs (calendars), kosher restaurant databases and recipes, and a few kitschy but fun apps. Of course, after The Jewish Week published my picks I began receiving email messages from app developers around the country (and from down the street) complaining that I didn't include their apps. Well, I couldn't include all of them. 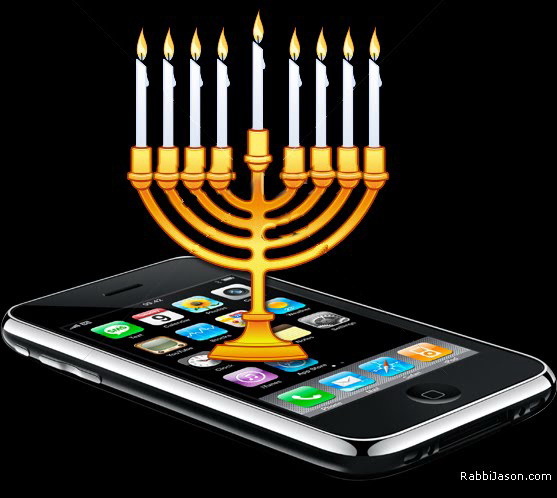 For Hanukkah alone there are dozens of apps that let users do everything from sing the blessings (Behrman House's (iHanukkah) and light virtual menorah candles (iMenorah) to spin dreidels on the iPad (Captain Moustache's Dreidel HD), catch jelly donuts (Catch the Sufgania), and learn the rules of the dreidel game (iDreidel). As I wrote in the introduction to the list of the best Jewish apps, "As more Jewish people acquire the latest in handheld technology, there will be more Jewish-themed applications available for download. Some of these apps will be utilities for checking the Hebrew date or learning about the weekly Torah portion. Other apps will be novelties like making shofar sounds for Rosh HaShanah and grogger sounds on Purim. With many Jewish developers around the world, you can be certain there will be no dearth of Jewish apps in the coming year." Here's the link to the list. 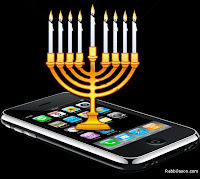 And as aways, check out www.jewishiphonecommunity.org for a comprehensive listing of Jewish apps as they are released. Just browsing and saw another iPhone app (for entertainment purposes) called "Jew Or Not Jew?" Basically the app tells you if celebrities are Jewish or not! Quite funny! The “Shabbat Candle Lightning reminder” application is a great way to be reminded of the Shabbat candle lighting time. The application automatically calculates the Shabbat entrance time based on your device network/GPS location and alert you about it. You can set the alert time from the application menu to determine the time of the alert before the Shabbat entrance in order to not forget lighting the candles. The UK’s Jewish Chronicle, the world’s oldest independent Jewish newspaper is now available as an app on iPhone, iPad and Android devices. Simply go to the App store bit.ly/Pd0Tl3 or Google Play http://bit.ly/NiydEn to download. Its a digital world.So this kind of app is very helpful.Nice post.much informative. Excellent post on iOS mobile apps development. The future of mobile application development is on positive note. You can make most it by having in-depth knowledge on mobile application development platform and other stunning features.